We will draw conclusion on the First article after 24 hours of publication of this article and this sentence will be replaced. To make a quick recall, for the practical benefits of Desktop Virtualization for Businesses, so far we have seen is mostly the savings on spending on Hardware, specially for the Client Hardware. Desktop virtualization can bring a huge advantage, in terms of the management within the company. Through the implementation of a centralized desktop model, many administrative problems can be avoided. On the local PC, support costs are very high, as an individual help for each individual user and a personal level jobs must be made. With desktop virtualization, the support for local PC is significantly reduced, almost superfluous. Although the support for local PCs almost invisible, this does not mean that generally less support must be made. What it does signify, the centralization of desktops and migration of the operating system and applications, data center, does a negative shift of support expenses – cost reduction. 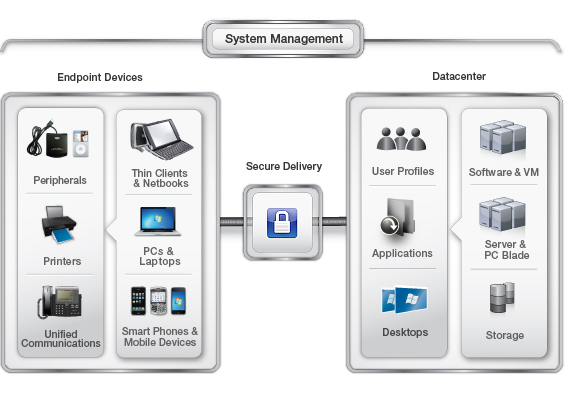 The advantage of a central desktop management is that, occurring problems are centralized. In a company there are usually several versions of Windows that are running on the local desktop. The fact that different service packs and patches intensify the management of the PCs. The Windows environments make a difficult management and support of the PCs. If a problem occurs once at a staff-PC level, time passes usually only to solve the problem and to make a diagnosis because the environments for each user are always different. This makes it difficult to troubleshoot desktop problems. Another advantage of the centralization of desktops is that maintenance visits, which represent a major cost in the support area, belong to the past practice, since all computer activity is now in the Data Center run. Expensive on-site repairs are no longer necessary. Unlike shifting to GNU Linux or other Free OS, minimal training is required. With virtual desktops, it is possible that employees at any time, any place can access to the data of the company. You can connect to any device with the appropriate software to the virtual desktop of the company. If there is any sick leave a continuity of the business transaction is guaranteed, because employees can work from home. The employee can access from to the same IT architecture and login to the familiar working environment. New desktops can be provided at any time for any user around the globe and are almost immediately available. By VDI thus also changes the desktop lifecycle. Very few computers in a company needed to be at full capacity of resources available. On the contrary: It is assumed that most computers are underutilized. For the most part, the computers are designed for high loads, which according to experience occurs/needs only a few hours a day, or even can be completely eliminated. The problem behind it quickly becomes clear: Under normal load, the available resources are not used. The advantage of desktop virtualization is a better hardware utilization and sustainable use of resource. Through Virtual Desktops, exactly the right resources are reserved in the data center, which requires the virtual machine at the end user. Under normal load can be used so with relatively little resources the systems. The unused resources in the data center are other virtual desktops or they can be used immediately at time of peak load. At no time power reserves are therefore potentially available. Other headers on the topic Benefits of Desktop Virtualization for Businesses are derivatives of the still discussed headers and are not repeated here. This Article Has Been Shared 1081 Times! Server Virtualization opened the possibilities and advantages for server, network and storage. Server offers a more efficient and flexible infrastructure. Open Virtualization Format was developed by the Distributed Management Task Force is a packaging standard deployment of virtual appliances. Cite this article as: Abhishek Ghosh, "Benefits of Desktop Virtualization for Businesses : Management and Flexibility," in The Customize Windows, November 28, 2013, April 20, 2019, https://thecustomizewindows.com/2013/11/benefits-of-desktop-virtualization-for-businesses-management-and-flexibility/.